Another midnight bake again. What to do, I need to wait 'til Shern is asleep only I can bake. Although muffins are actually a quick fix, I took a longer time for this batch because I could not decide on what to bake. My hands were itching to bake but I had no recipe on mind. Furthermore, I did not have any fruits or nuts with me at the moment, so I was searching for a recipe which calls for basic ingredients which I already have. Saw this Mocha Muffins recipe on joyofbaking which I had always wanted to bake. I did not have any almonds so I omitted those. I replaced the white chocolate chips with normal chocolate chips because I do not like white chocolate. I also like the fact that this recipe calls for the use of whole wheat flour in half of the flour ingredient. 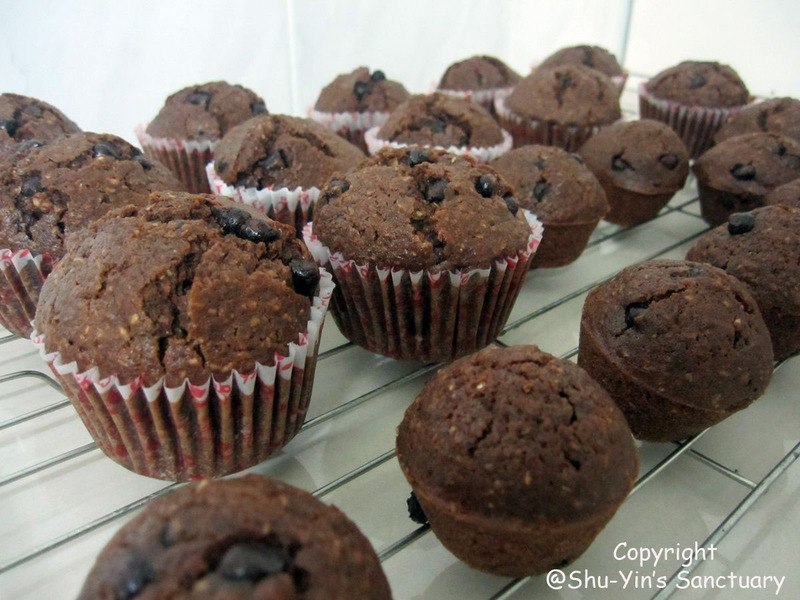 The give the muffins more texture and also a 'lil more healthy. This recipe yields 12 regular sized muffins. But as my silicone muffin pan yields smaller sized muffins, I had leftover batter. 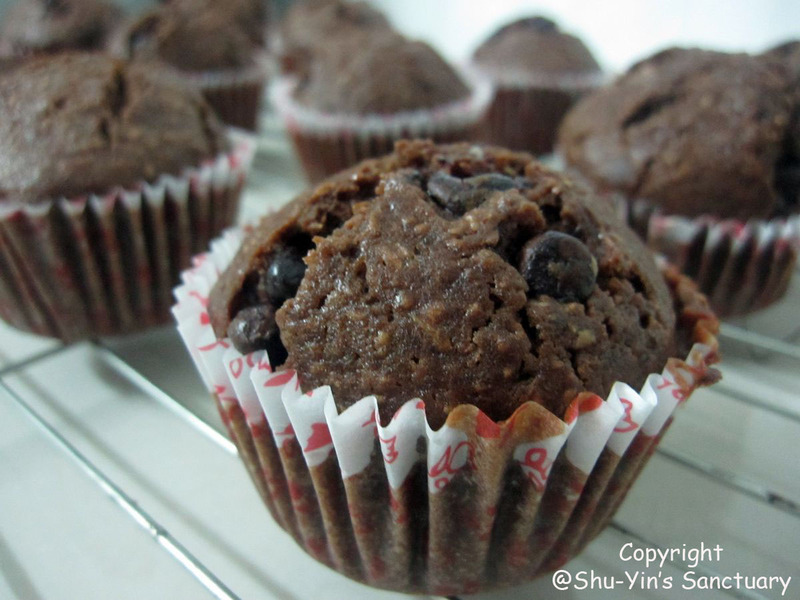 So I baked them using my mini muffin pan. They are really mini. In a large measuring cup or bowl whisk together the eggs, buttermilk, oil, coffee, and vanilla extract. In another large bowl combine the flours, cocoa powder, brown sugar, baking powder, baking soda, and salt. Stir in the chopped nuts and chocolate chips. With a rubber spatula fold the wet ingredients into the dry ingredients and stir only until the ingredients are combined. Do not over mix the batter or tough muffins will result. 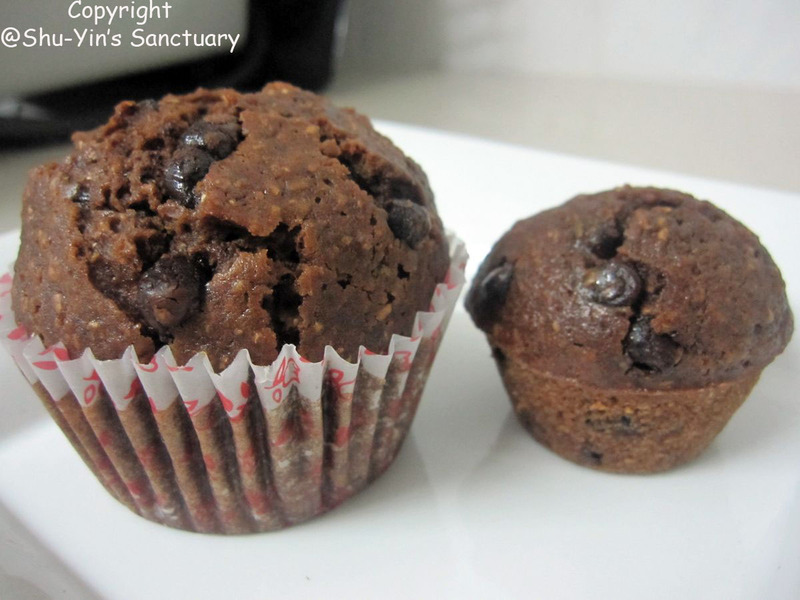 Evenly fill the muffin cups with the batter, using two spoons or an ice cream scoop. Place in the oven and bake until a toothpick inserted in the center of a muffin comes out clean, about 20 - 25 minutes. Transfer to a wire rack and let cool for about 5 minutes before removing from pan.